Sometimes a steady and patient approach, even a mysterious one, is the best way to develop a new band. Sweden's Cruzh kept their identity a secret in 2013 while delivering two singles to the Internet. The veil was lifted later in the Fall: Cruzh was formed from the ashes of the inconsequential glam band TrashQueen. The band features former members Anton Joensson and Dennis Butabi Borg, along with Tony Andersson, a studio musician. They went on to release two EPs. 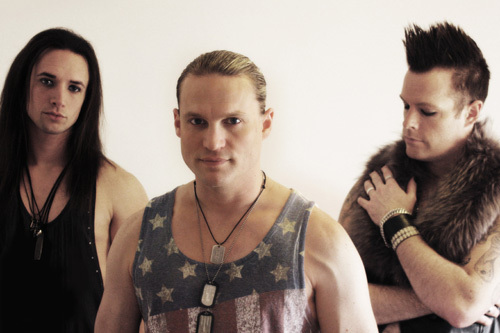 Before releasing a third, Frontiers Music offered them a job, and the self-titled Cruzh album was born. Perhaps the first thing to note here is that Cruzh is not a resurrection or clone of TrashQueen. This is not a glam slash sleaze band. Nope. Cruzh falls into easily into the AOR melodic rock style. It's not that their songs can't have some edge, notably in the riffage, but their sound leans to the milder AOR side of things. Emphasis is definitely placed upon song melody and vocal harmony. Throw in some piano, as with the song Stay, and you have a mellow ballad with some West Coast breeze. Similar, possibly even more subtle and subdued, is the vocal rich Anything For You. Alternatively, some songs are bolder, yet without going over the heavier edge cliff. One is Hard To Get, which begins with a smooth vocal harmony, only to lead into strong riffs and significant groove. First Cruzh rocks with some edge, but lacks the AOR groove accessibility found in most other songs. A better choice is Aim For The Head. Bold riffs, sweet groove, tasty vocal harmony, singular melody, and a catchy refrain combine for arena ready hard rock strength, while never giving up that AOR sensibility. It's the best song on the album. Unfortunately, not every song rises to the same caliber. Nevertheless, Cruzh's debut album is a fine first effort: adequate and entertaining AOR melodic rock from this talented trio. Recommended. 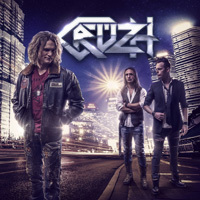 Cruzh's debut album is a fine first effort: adequate and entertaining AOR melodic rock from this talented trio. Recommended.